The powerful governor, who recently accepted officials and businessmen of south Kyrgyzstan for "registration" purposes, lost everything. The tragedy ended up with farce. Dangerous and "evasive Joe", accused of incitement of ethnic hatred, establishment of armed groups and organization of mass riots, resulting in the death of hundreds of people, used the stage make-up, wig and beard. He visited home town, stayed with relatives although they should have become the priority target of law enforcement bodies. Such ignorance of conspiracy rules could be referred as loop of vigilance if someone does not know local realities. Up until recently Bakiev’s clan felt themselves secure in Jalal-Abad. Even when Janysh Bakiev, the head of presidential guard service, was put on Interpol’s official wanted list, his son was regularly doing his job in the Public Prosecutor’s office. Commenting on the situation, that time commandant of the Jalal-Abad Oblast Kubatbek Baibolov said "They all feel very comfortable there!" The problem is not that Akhmat Bakiev was able to hide; the circumstances of his seizure prove that he was not professional conspirator. The appropriate authorities did a bad job looking for him. The interim government ambassadors, such as commandant Baibolov, faced strong opposition from local law enforcement officers’ side, still supporting the overthrown president and his family. In the last five years the law enforcement system, special services and army, headed by relatives or teammates of Kurmanbek Bakiev, attracted personnel, loyal to the family. In addition, we should consider compatriot’s solidarity, traditionally strong in southern region. Besides, people have an opportunity to buy their freedom (allegedly, this way Janysh Bakiev escaped the arrest by Bishkek special task forces). Therefore, we have the number of reasons why the president’s brothers are still free. The current arrest of Akhmat Bakiev evidences the fact that after the referendum the government fortified its positions in the south. Most likely, the security officials from Bishkek attracted allies in this region. Immediately after hearing news about detention of Akhmat Bakiev the news agencies made a statement that attracted wide attention. The sister of Deputy Bayaman Erkinbaev, killed five years ago, informed that her nephew Emil Jusupov and his four friends monitored the moves of Akhmat Bakiev and took him to the security agency. The nephew denied this statement, but it looked like it was "step back" in order to hide inconvenient truth. Many people trusted Bayaman’s sister since this family had serious reasons to pursue Akhmat Bakiev. The godfather Bayaman Erkinbaev controlled the business in the south, including the part of famous Karasu market. He was standing side by side with Bakiev’s brothers while overthrowing Askar Akaev. Shortly after the revolution he joined the opposition forces. "We will overthrow him in the same way he came to power", said Bayman in the interview, hinting on President Kurmanbek Bakiev. This conversation took place in the summer of 2005 in his deputy’s office in Jogorku Kenesh. This was the most challenging period in the opposition between him and newly elected president. The intensive redistribution of wealth was taking place throughout the republic. As a result, the new and new owners of the property were emerging; allegedly, Erkinbaev was also "degreased". The logical end in this process was the murder of Bayaman by the bullets of hired killer in September of 2005. Step by step the south became ruled by the unofficial governor Akhmat Bakiev and his brother Janysh, the all-mighty head of presidential guard service. In the opinion of Kyrgyz security officials, they were controlling legal and illegal business in entire region. 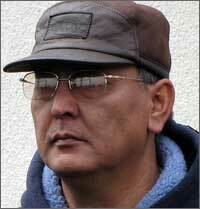 Delo # Kyrgyz newspaper… The pieces from Akhmat Bakiev’s diary were published in July 1, 2010. This unique document says that there was strong division in Bakiev’s family: Akhmat was irritated by the operations of his nephews (Maxim and Marat), the sons of Kurmanbek. "We lose time talking to them. They will never understand us. They will say yes, but will do their own things", writes Akhmat (if this diary is not an artifact. However, it would be still interesting for us). The April revolution undermined the status quo. Bayaman’s teammates, some of which gained high ranking official positions, finally got a chance. At the end of April, given the turmoil in the south, Akhmat Bakiev was secretly kidnapped. The relatives blamed the interim government; however, it looks like they did not believe in this since they refused to give testimonies in the law enforcement office. According to Kyrgyz security officials, Bakiev was kidnapped by Bayaman’s people in order to make him return expropriate property. Performing their requirements, the unofficial governor was released. So far it is not clear who Akhmat Bakiev gave money to in exchange for freedom and who will ultimately become "the ruler" in the south. The redistribution of power with active involvement of criminal structures, officials and security officers, is still in progress. We have serious reasons to believe that Osh tragedy was the episode of big criminal "fight" where the target was entrepreneurs’ property. The official government blames the relatives of ex-president and Uzbek community leaders in organization of interethnic clashes. According to the proposed versions, Bakiev’s clan organized turmoil in order to return to power while Uzbek leaders facilitated the incitement of ethnic hatred. All these statements are probably true with regards to May events in Jalal-Abad. Bakiev’s people were trying to put their person as the governor, but pulled back, seeing the resistance from interim government and Uzbek groups. The statements of Kadyrzhan Batyrov, the leader of Uzbek community, on granting official status to Uzbek language in the areas, populated by Uzbeks, and his calls for Uzbeks to get more actively involved in politics produced discontent among Kyrgyz people. Four days after the accusation of Batyrov in burning Bakiev’s houses in Teyit village the indignant crowds devastated the University of People’s Friendship, sponsored by Batyrov; by the way, the office of his Rodina party was also located in this building. Osh scenario was different. If the events were motivated by words and actions of Batyrov, as it is alleged today, why would indignant people wait 20 days in order to revenge Uzbeks? This does not match explosive temperament of Kyrgyz. Why would Osh Uzbeks be revenged if Batyrov was guilty? There are no answers to these questions. The witnesses say that interethnic tensions started growing in Osh long before the events in Jalal-Abad while the riots were organized by criminal groups and young men from all over the republic, recruited by them. Nonetheless, the version, involving criminal structures, is carefully avoided by officials. This understandable: if you start investigating the criminal ways will lead to disgraceful officials and their partners in law enforcement structures. The new government cannot resist this powerful network yet. Perhaps, this is the reason why Roza Otunbaeva insisted on involvement of human rights advocates and international organization in the investigation of tragedy. However, even unbiased international investigation, if it is ever conducted, will not solve all problems in the south. The new government may face the following alternative: they will either end criminal-official partnership rule in the south or will be overthrown by conspiracy and riots. The stability in the republic will depend on who will win this game: new unofficial governors from south, replacing Bakiev’clan, securing "the roof" in Bishkek, or other forces? Speaking of Kyrgyzstan in the future, it is worth mentioning Akhmat Bakiev that few years ago wrote down the warning for his brothers about social justice: "Kyrgyz will forgive once or twice, but some day they will make a stand". He also mentions that "president’s family is involved in corruption". Addressing brother Marat, Akhmat Bakiev recommended his nephews Maxim (controlling business) and Marat (controlling customs, financial police and tax authorities) to read "Ancient Turkoman", written by Lev Gumilev, in order to learn the character of Kyrgyz people that were loyal to khan only "if khan and his family were fair". Well, the warning remains important after April revolution as well, since Kyrgyz did not change in this sense.